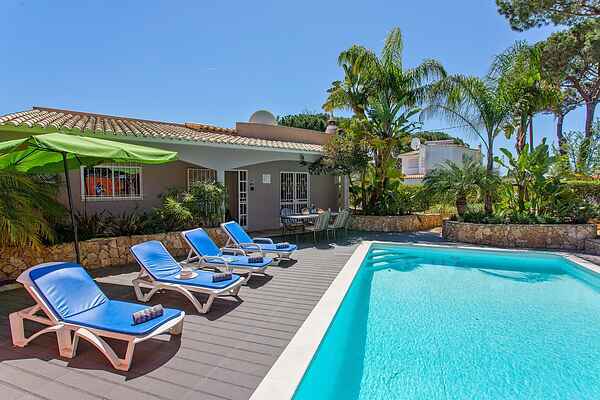 Relax completely in and around this fantastic villa! Plenty of privacy! You'll have access to a well-kept, entirely enclosed garden with lovely private pool. After a refreshing dive you can relax on one of the many terraces, or use the outdoor kitchen to prepare a delicious lunch! A barbecue is also provided. This villa is situated entirely on the ground floor, and has a comfortable, well-kept interior. With a lot of love and taste the owner created this very nice spot. Enjoy air conditioning throughout the entire villa. From the master bedroom you open the sliding doors to the garden to the side of your villa. You are 1 km away from the supermarket. Then your surroundings: via the lovely green hinterland you'll reach the Moorish castle ruins of Paderne (20 km). Fun fact: this castle is one of the 7 you can find on the Portugese flag. Visit also the church of São Lourenco in Almancil (10 km), and admire the beautiful interior decorated with blue-white azulejos. The children will certainly want to visit one of the water parks. Near Albufeira (20 km) you'll find the park Aquashow with several water slides, a water roller coaster and wave pool.